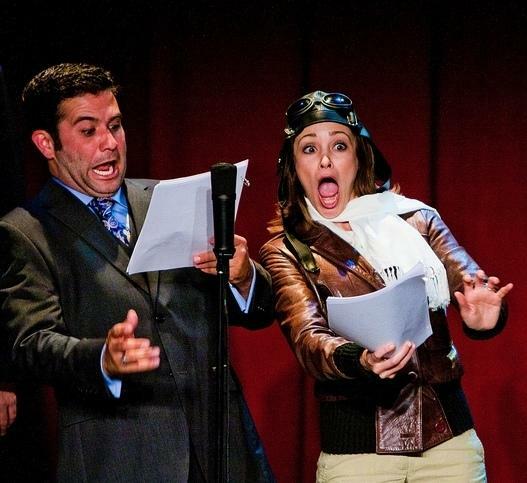 Mark Gagliardi and Autumn Reeser, as aviator Amelia Earhart, perform in The Thrilling Adventure Hour. Actors dress up and read scripts onstage in front of a live nightclub audience. 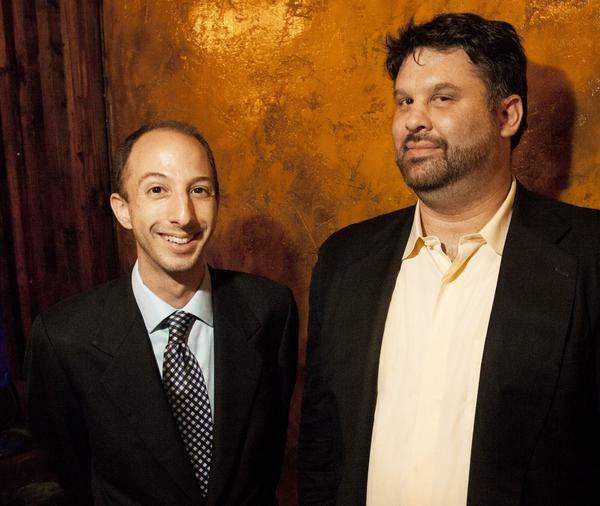 Ben Blacker (left) and Ben Acker are the co-creators of The Thrilling Adventure Hour. They first met while waiting in line at college. 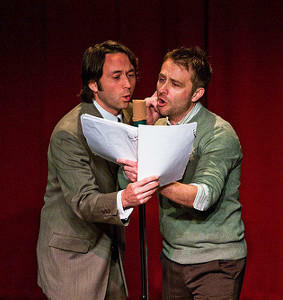 Mike Phirman and Chris Hardwick perform in The Thrilling Adventure Hour. The creators of The Thrilling Adventure Hour proudly call it "fake radio." It's less an homage to old-time radio and more of a clever update. A live monthly performance at Largo, a 200-seat, scruffy-chic Hollywood nightclub is also available as a popular podcast through Nerdist. One of the show's episodic heroes is a kind of mashup of Buck Rogers and the Lone Ranger, called Sparks Nevada, Marshal of Mars. He even has a snappy theme song, with such lyrics as: "You can have a lot of fun on the Red Planet, but a fella's gotta be careful, too. Danger's a-lurking over every space mesa and planetary plateau." Nevada is played by actor Marc Evan Jackson, and regular guest stars include the likes of Nathan Fillion (Firefly), James Urbaniak and musician/comedian Reggie Watts. That's partly what keeps Mark Wallace coming to the show. He's seen The Thrilling Adventure Hour no fewer than 10 times. Wallace works for the space program, describing himself as an "interplanetary travel agent," and he's especially partial to the Sparks Nevada character because of, well, the Mars thing. "They made a joke about, you know, hyper cattle — I started laughing really hard because we're looking for methane on Mars, which is what cows produce," Wallace giggled. "It's brilliant and hilarious." The Thrilling Adventure Hour was created eight years ago by a pair of friends, Ben Blacker and Ben Acker. (Yes, for real.) They met standing in a line in college. "Ben heard me say my name, and I said, 'That's a lot like my name!' and he said, 'Oh, you're a dope,' " the Bens say, overlapping each other in the recounting of the story. The Bens, as they're known, studied film and scriptwriting at Syracuse University . During Acker's senior year, he was driving around listening to the radio when a drama came on. He had what's known in public radio as "a driveway moment." He listened, transfixed, resolving to find whoever was making these great radio dramas, and join them. "And at the end they said that this was a rebroadcast of a 1950 episode of The Shadow. And I was like, 'Now I don't know what I'll do!' " Acker says. Radio drama ended up not really being the end game. Acker and Blacker went to Hollywood to become TV writers. They initially wrote Sparks Nevada as a screenplay and got a bunch of their actor friends to do a table read. But they had so much fun they decided to keep it going as a pseudo radio show — first, live; and starting about five years ago, as a podcast too, with growing clout in a circle of Hollywood actors. It's the Bens' winsome writing, but also the nostalgia factor and the ability to read off a script and not have to memorize lines that's lured Jorge Garcia of Lost into repeated guest-star stints. For this performance, he's playing a vampire who's "lost his thrall" in another regular serial called "Beyond Belief." It's about a pair of high-society mediums named Frank and Sadie Doyle. "It's The Thin Man with ghosts," Blacker helpfully explains. Garcia says one of the pleasures of the old-time radio aesthetic is wearing a suit onstage: It's fun to dress up to be on fake radio. "I love the way it harkens back to a different time when they did shows," Garcia reflects. "I love having to put on the jackets and ties, like actors back then acted for radio." Another key point of authenticity is the total lack of swearing. That's a point of pride for writers Acker and Blacker. Still, Acker says he occasionally has to reassure a parent wondering if an episode is really family friendly. "It is, but we're gonna kill a robot and a Martian, and there's gonna be vampire-on-vampire crime and drinking," Acker says. "So it's family friendly if you're OK with all that stuff." Whatever the family, the show is friendly enough to make The Thrilling Adventure Hour almost as popular on iTunes as its competitor, A Prairie Home Companion. "We used to try and start a beef with A Prairie Home Companion, like an East Coast-West Coast rapper feud to get us on the map," Acker says. "We would call those guys out, East Coast-West Coast, except that guy don't got no coast." Lake Wobegon, you're on notice. The Thrilling Adventure Hour recently branched out with live shows in Brooklyn and San Francisco. This year brings new platforms — a graphic novel, a behind-the-scenes Web series and a concert film. One of iTunes' most popular comedy podcast at the moment is decidedly old-fashioned. CORNISH: The show is recorded once a month in front of a live audience. NPR's Neda Ulaby recently caught a taping at a Hollywood nightclub. 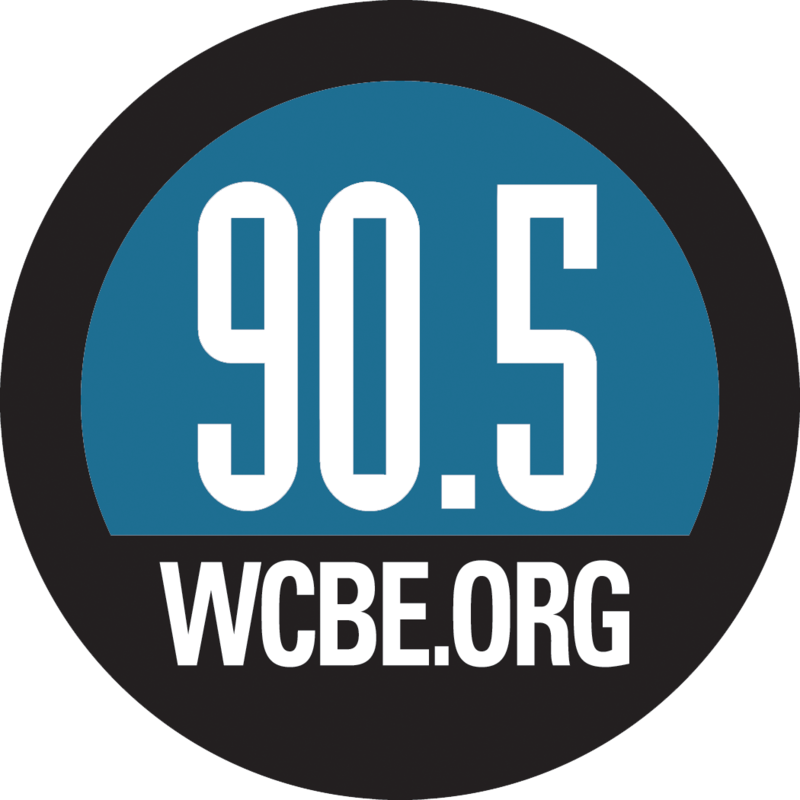 NEDA ULABY, BYLINE: "The Thrilling Adventure Hour" proudly calls itself fake radio. It's less an homage to old-time radio and more of a clever update. So one of its heroes is a kind of mash-up Buck Rodgers and the Lone Ranger named Sparks Nevada, Marshall of Mars. ULABY: "The Thrilling Adventure Hour" is filled with original songs and special effects, like when Sparks and a cyborg break into the mainframe of a spaceship. ULABY: And he fights off evil aliens like the fearsome baddies the Murder Men. ULABY: "The Thrilling Adventure Hour" was created eight years ago by a pair of friends - Ben Blacker and Ben Acker - for real. They met standing in a line in college. BEN BLACKER: Ben heard me say my name. BEN ACKER: And I said that is a lot like my name, and he said, oh, you're a dope. ULABY: The Bens studied film and scriptwriting. During Ben Acker's senior year, he was driving around and heard a drama on the radio. He was completely inspired. ACKER: Wherever they're doing this, I'm going to go there. I'm going to sit here. I'm going to find out where that is. I'm going to help with this because this is great. And at the end, they said that was a rebroadcast of a 1950 episode of "The Shadow." And I was like, oh, well, now, I don't know what I'll do. ULABY: Acker and Blacker went to Hollywood to become TV writers. They wrote "Sparks Nevada" as a movie and got a bunch of their actor friends to read the script together. They had so much fun they decided to keep it going as a pseudo radio show. First live and starting about five years ago as a podcast, too, with a growing fan base. MARK WALLACE: It's an old-fashioned variety show for the nerd herd, for the geeks among us. ULABY: Mark Wallace is heading into the nightclub where "The Thrilling Adventure Hour" is staged every month. He's seen the show live 10 times. He's here with a herd of guys who, like him, work for the space program. WALLACE: I'm an interplanetary travel agent, basically. I figure out how to get spacecraft from point A and to point B in the solar system and then what to do with them when they get there. ULABY: Wallace says the space program people are especially partial to Sparks Nevada, Marshal of Mars. WALLACE: ...it was just brilliant, and it's hilarious. ULABY: This is a crowd also lured by frequent guest stars from such shows as "Buffy the Vampire Slayer" and "Firefly." This show featured Jorge Garcia from "Lost" in an episode with two recurring characters, a pair of high society, married mediums named Frank and Sadie Doyle. ULABY: They're not just supernatural sleuths. They're martini swilling millionaires, happy to provide a very bloody Mary to Garcia as a visiting vampire. ULABY: Garcia says guesting on "The Thrilling Adventure Hour" is a cinch. You don't have to learn lines. Everyone uses a script. And that old-time aesthetic means wearing a suit on stage. It's fun to dress up to be on fake radio. JORGE GARCIA: Well, I love the way it harkens back to a different time when they did this, did shows like having to put on the jacket and the ties and just kind of like actors back then acted for radio. ULABY: Another key point of authenticity is the total lack of swearing. That's a point of pride for writers Ben Acker and Ben Blacker. Still, Acker says he occasionally has to reassure a parent wondering if an episode is really family friendly. ACKER: It is, but we're going to kill a robot and a Martian, and there's going to be, yeah, a vampire-on-vampire crime and drinking. So, like, it's family friendly if you're OK with all that stuff. ULABY: Enough to make "The Thrilling Adventure Hour" almost as popular on iTunes as its competitor "Prairie Home Companion." BLACKER: (Unintelligible) West Coast, no coats. ACKER: Yeah, that's right. That guy got no coats. ULABY: Lake Woebegone, you're on notice. "The Thrilling Adventure Hour" recently branched out with some live shows in Brooklyn. This year brings new platforms: a graphic novel, Web series and a concert film.